With dissolution little over a month away, we’re not going to see any more by-elections this parliament. Even if an MP dies in the next few weeks, convention dictates their seat will remain vacant until the general election on 7 May. 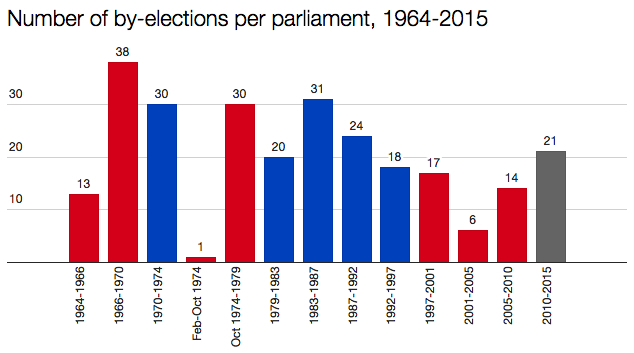 The different lengths of the parliaments of the past half-century make it tricky to discern any pattern in the number of by-elections, though it’s clear the overall volume has declined. Consider the four-year Labour government of 1966-70, when 38 by-elections took place: that’s over six times the number that took place in the four-year Labour government of 2001-05. You can see there is a general trend downwards, perhaps summed up by the years when there have been no by-elections at all – 1992, 1998 and 2010 – falling within the second half of the 50-year span. The sudden spike in 1986 is to do with the decision by 15 Northern Ireland MPs to resign in opposition to the Anglo-Irish Agreement and seek re-election (which all but one achieved). This last graph suggests another trend: one of by-elections becoming less an opportunity for defeating the incumbent and more an exercise in parties holding their seats. Only one marginal changed hands: Corby, won by Labour from the Tories. Note that most of these swings were achieved by smaller parties: three by the Liberals/Lib Dems; two by the SNP; and one each by Ukip and Respect. Of the two big parties, Labour only makes three appearances in the top 10, while the Tories do not appear at all. 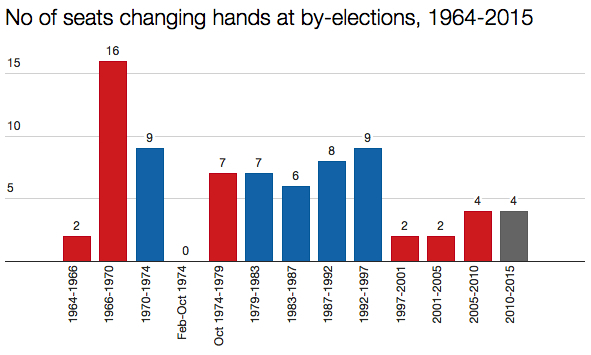 Of all the parliaments of the past 50 years, 1966-70 was clearly the bumper period for by-election fans. Not only were there a whopping 38 contests in total, 16 of them saw a seat change hands. I suspect the days of such a high turnover of MPs are long gone. This will disappoint those who are partial to the late-night thrill of a by-election – but greatly relieve those whose job it will be to piece together the next government in what will most likely be another hung parliament. Strangely enough there has been no by election this parliament with Tories in first place and LDs in second place which would have been interesting but in Feb 2013 we had Eastleigh with LDs first and Tories second and LDs held it and UKIP came second. I think there is another chance since GE1997 in that party that held the seat has chosen the date of the by election as early as possible (exception was Glenrothes) whereas previously it was usually a 3 month wait till by election date. 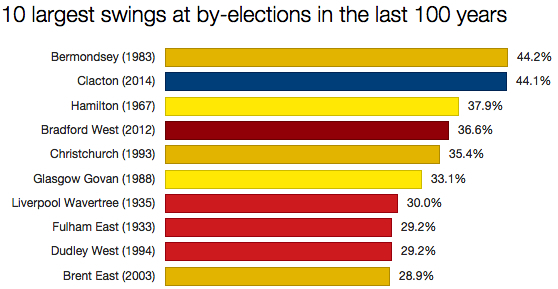 Ignoring the 1986 mass resignation, are most by-elections caused by the death of incumbent? Most MPs tend to be men in their middle age or older, so a general increase in health consciousness (less drinking and smoking, more exercise) and a corresponding drift upward in life expectancy might go some way to explaining why there have been progressively fewer by-elections in the decades since the 1960s. 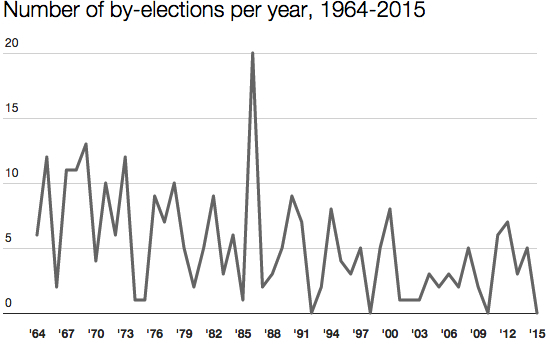 As shown above, by-elections happen for plenty of reasons. However, death/ill health of incumbent is probably most common. There’s no real health related pattern here. The main decreases have come in appointments. of various kinds – to the House of Lords, while many in the ‘other resignations’ categories from the 60s and 70s are appointments to official posts or corporate directorships (Cameron take note!). The rise of these again in the 00s and 10s comes predominantly from people standing down to contest elections in devolved parliaments and the PCC posts. In fact in the 90s and 00s, as causes of other types of by-election fell, the percentage which have been health-related increased. The impact of the MPs expenses scandal is notable, accounting for 6 of the 8 scandal related resignations in the 00s and 10s. Whether scandal realted resignations will continue to remain high is unknown I guess, but we might imagine that they will in the era of social media. What’s notable is the absence of these from the 1990s! It might also be reasonable to speculate that several of the 60s and 70s resignations due to ‘appointments’ might have scandal-related causes behind them. A note on counting – With the exception of Bobby Sands, which went into ‘principle’, I’ve put all other deaths as ‘health’ – some of these could be recounted as scandals (ed Stephen Milligan). Hmm, my table wasn’t as pretty as it looked in the comment box! Hopefully it is still legible though. Fascinating stuff, Rob – thanks for sharing it. Previously I’d have assumed health was much less of an issue now than a few decades ago, but it’s interesting to be proved wrong. It’s also useful to be reminded of how leaving parliament mid-term for another high-profile job used to be very much the norm. Such behaviour was thought of as almost an honourable pursuit. Nowadays I feel it would be regarded rather suspiciously. Ok, well that is one hypothesis comprehensively demolished! Nothing to do with health, it seems. Thanks, WhatisRobShaw. So, why don’t MPs resign now? Since the 1970s, there seems to be a bit more scandal, but MPs are less likely to resign to join the Lords (waiting for dissolution honours, and/or not bothered about a life peerage?) or to concentrate on other career options. I wonder why. Being paid enough, perhaps?